Chocolates - Good Or Bad For You ? We all love eating chocolates, no matter what. 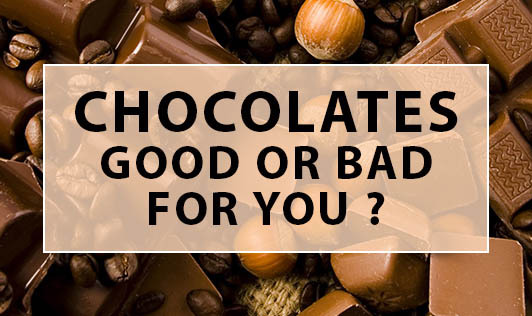 But there is always a question that comes to everyone's mind - Are chocolates "Good" or "Bad"? The answer to this question is not that easy. The effects of chocolate on health vary according to the type of chocolate being eaten, which is also still debatable. Some types may be good, whereas another variant may have an adverse effect on health. What it is that, which is so addictive with chocolates? Dark chocolates are known to boost heart health, which varies from increased blood flow, less platelet stickiness and clotting, and reduced bad cholesterol. Chocolate acts as a mood enhancer that raises the level of the brain chemical serotonin, responsible for one's mood. Studies have shown that cocoa in dark chocolate is not a big contributor to tooth decay; and it is not linked directly to plaque and cavity formation. Dark chocolates help to fight against immune suppressing cells, as it contains good anti-oxidants like flavonoid compounds. Acts as stimulant that triggers the central nervous system, relax the blood vessels due to the presence of natural chemical substances like xanthine and theobromine. Chocolate is an energy dense food. Therefore eating a large quantity can result increased body weight, further leading to several health problems. Some chocolates are rich in saturated fats, which might lead to cardio vascular problems like increased cholesterol levels, blood pressure etc. Sugar being an ingredient of various chocolate preparations; Diabetics should watch out as it can increase the blood sugar beyond the normal levels. Dark chocolate has more caffeine than white or milk chocolate since it is closer to chocolate's natural state. This may stimulate the nervous system which might therefore interfere with the sleep patterns and might trigger migraine headaches in some individuals. Go modest with chocolates. Whether the chocolates are good or bad, pay attention to the type of chocolates you choose and how much of it you consume!